Beyond Coping with the subtitle: A Study Guide on Aging, Illness, Death, & Separation consist of five passages derived from the Pali Canon. The book gives specific advice on how to deal with problems of aging, etc. The Buddha’s teachings on kamma provide an important underpinning for how problems of pain and illness can be approached. 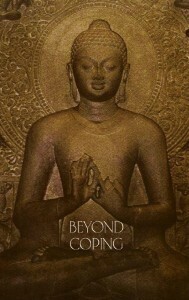 Thus some of the passages focus on how practicing the Dhamma can cure a person of illness, whereas others focus on how the Dhamma can ensure that, even though a person may die from an illness, the illness will make no inroads on the mind. You will also in the last passage find examples on how the Buddha and his disciples skillfully negotiated the problems of aging, illness, death, and separation. Stellar work there evyenore. I’ll keep on reading.